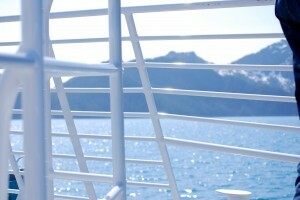 A kid's-eye view from most Alaskan day-cruise boats. 1. Proper clothing: Quality rain gear consisting of jacket and pants for the outside, and layers for the inside. Begin with a wicking long-sleeved tee, add whatever cool character tee you child insists upon (oh yes, we’ve been here, too), then put on the fleece topper. Don’t forget a warm hat (no ball caps, besides furnishing nothing in the way of warmth, they also blow off!) 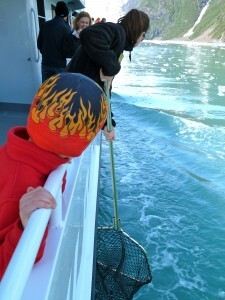 and mittens/gloves, yes, even on a sunny day it is COLD on the water. Non-skid shoes are a must; skip the princess slippers on this trip, Prince Charming will understand. Bring sunglasses; besides looking incredibly cool, they help with the glare from gorgeous Alaskan waters. Make sure shades are polarized to maximize viewing and minimize potential damage to little peepers. Even sunny summer days can be chilly! 2. Binoculars: Some tour companies provide them free of charge for the cruise, others rent for a fee. Ask before booking and make sure your family has at least one set available for use during the entire cruise. 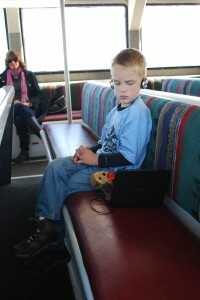 AK Kid loves to be the “lookout”, and usually looks more at fellow passengers than wildlife, but rest assured he is no trouble with a set of binos around his neck. Have a short lesson in safe and proper use of binoculars before wildlife appears in the scope; squinting one eye may work for a while, but it’s bound to create a headache, too. Also insist upon utilizing that handy strap so no binos end up over the side of the boat. Ahem. Ditto for a camera. Give ’em a chance to record the day their own way! 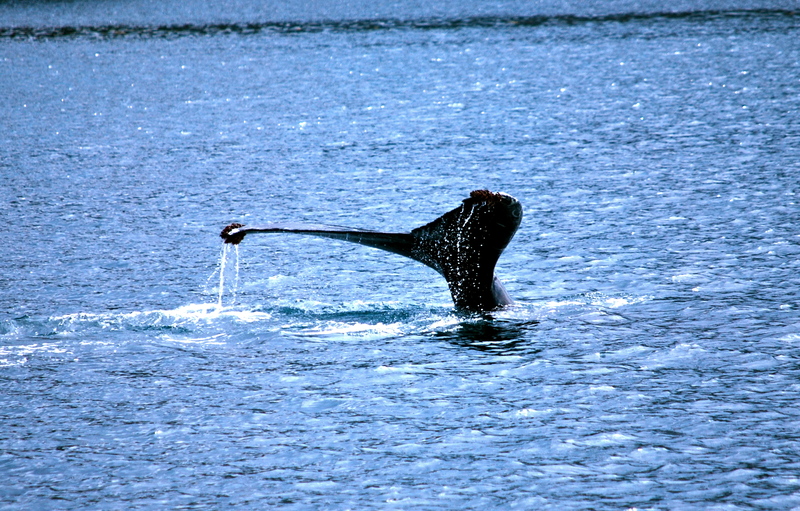 Wildlife is everywhere in, on, and around Alaskan waters. 4. Medicine/First Aid Items: When I was asked before our first cruise if AK Kid had any inclination toward motion sickness, I looked at the person behind the counter and said, “Uh, I don’t think so,” because I hadn’t really thought about it. Fortunately, he doesn’t, given his penchant for spinning around in circles on the tire swing and reading in the car, but many children do. Also, many visiting families from landlocked states like, say, Iowa, have not ventured aboard such waters before, and they too may be unfamiliar with the rocking and rolling of a tour boat, even on a calm, clear day. This is the ocean, people, and swells come up constantly. Bring ginger candy, a can or two of ginger ale, and perhaps consider the Dramamine or other motion-sickness medication. Taken an hour or so before embarking on a cruise, this can dramatically reduce the incidence of seasickness among the younger set. Check with your doctor beforehand, however, to make sure dosages for little people are taken into account. I also bring an over-the-counter pain reliever as well, because kids get sick at the darndest times, don’t they? Bandaids are nice to have on hand, too. Kenai Fjords crew member scoops up glacial ice for close inspection. 5. Amusements: Double star and underline this one, and do the math with me. Six-hour cruise = one hour out from harbor at a fast clip which is exciting to youngsters + four hours wildlife watching – one hour of searching for said wildlife + one more hour of glacier ogling – one hour looking at seabirds + one hour of returning home at same breakneck speed. Conclusion: At least a few of those hours are going to be boring for kids. Birds just don’t cut it for children for more than 10 minutes but many cruisers come on the boat specifically to see nests, puffins, and red-faced cormorants do their thing. You must have something for kids to do. Skip the tiny little army men and Littlest Pet Shop sets; the motion of the boat and wave-jumping will make the little creatures skip off the table and onto the floor where they face certain peril. 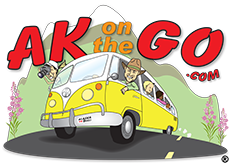 We bring activity/coloring books, pens, pencils, crayons (sometimes I send AK Kid on a daylong scavenger hunt for wildlife); our REI Adventure Journals; card games like Uno or Go Fish; all the fun-with-food items above; and, and, and…..the DVD player. I’m not proud; after four hours of helping my son remember to keep his feet on the deck and his hands off the binocular lenses and his face clear of the captain’s window, I’m bushed. He is, too. So we bring the appropriate DVD’s featuring sea-worthy movies. “Treasure Island” from Disney, “Pirates of the Caribbean”, a few “National Geographic” movies, and the like. 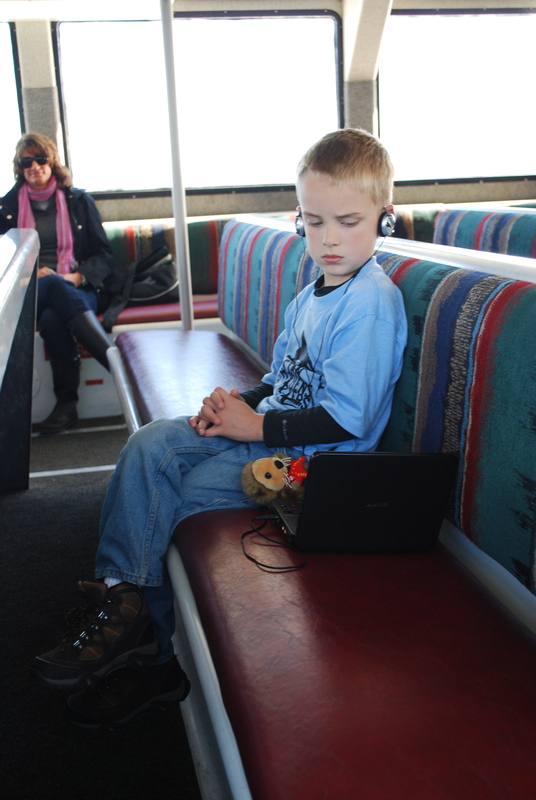 It works, mateys, and everyone around me is always applauding by the end of the trip because their kids invariably end up watching with our kiddo, too (I always have extra headphones along as well). Yes, a little down time can be a good thing. A few extras for parents…investigate your cruise options, ask questions, and be sure the cruise you want is the cruise best suited for the youngest member of the family. A cruise with a National Park ranger aboard, for example, is great for kids. 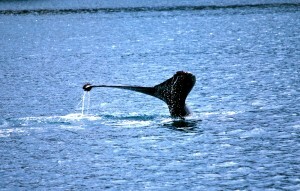 Try Kenai Fjords Tours or Major Marine for a ranger day. 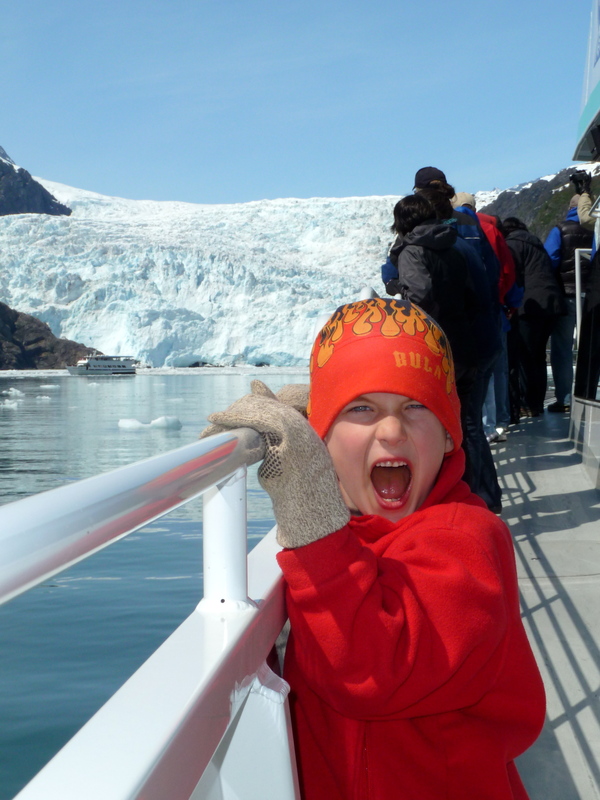 Posted in Kenai Peninsula, Logistics With Kids, Wildlife/Glacier cruising and tagged Glacier Cruising, Seward, Wildlife Cruising.